The Scots know well how to build castles. None of those battlements, crenellated towers and narrow windows for shooting arrows through here! This one is more like a country home - albeit a large one. 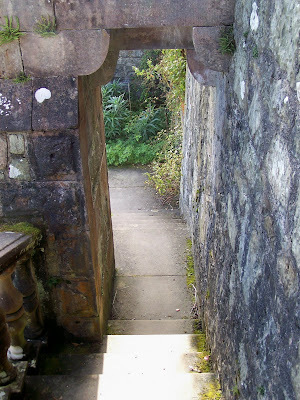 These photos were taken at Torosay Castle on the Isle of Mull, off the west coast of Scotland. It was a sunny(!) day in September. We were lovely and warm - probably because we were wearing several layers of clothing. 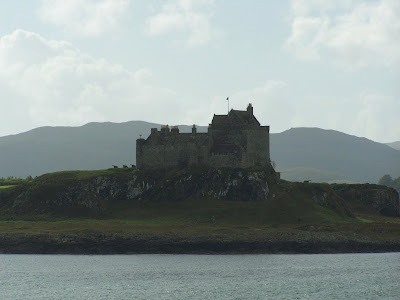 Also on Mull, this is Duart Castle. 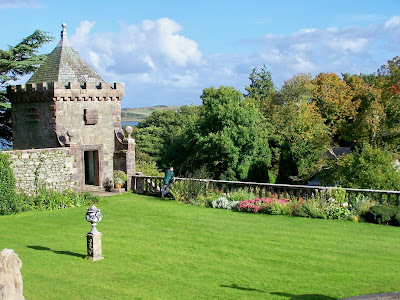 Older than Torosay, this one at least has a wall and battlements. And lots of chimneys! As we all know, however, an Englishman's home is his castle. So, here's mine, taken in the snow last winter. I love castles, too. Wouldn't want to live in one, though -- unless someone else is doing the cleaning. 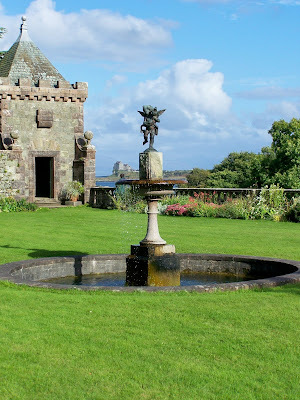 I have also posted photos of castles in Scotland -- LOVE Scotland. It's absolutely gorgeous. Duart looks really cool. I've never been to an actual castle... need to rectify that, I think. Well you castle looks exactly liek the one I grew up in London. Is it? Stunning photos. Loved the shots of your "castle." awww, I like your castle. Lovely pictures! I'd love to visit Scotland some day! Ah snow! It's lovely! 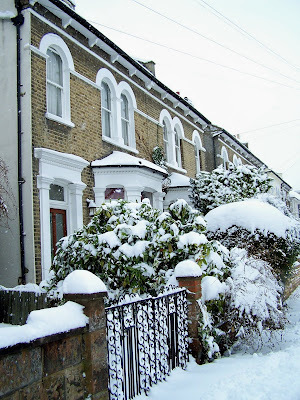 We've never had snow where I live, and I doubt we ever will, unless there's a sudden climate shift (knock on wood). Yes, Scotland is like a fairy tale in my mind. The rolling hills, the light fog, the breeze, and of course the castles. Ah! I wish I was back! Here's my take on the theme: El Rey(jr) visita los castillos! Great post! I have always wanted to go to Scotland. Hopefully someday. What a lovely pic of your castle all covered in snow. Can't beat that! 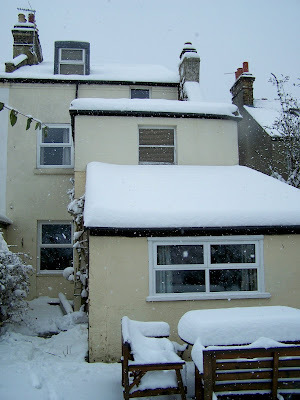 These pictures were great, and your own "castle" looks lovely blanketed in snow! That's a great collection of un-castle-like castles. A lot of our American millionaires who sttles in this area made their own castles on this Scottish model. Penny for the guy! Have a great Guy Fawkes night! Being a colonial in a county populated by the brits only 200 odd years ago, there's not a castle in sight unless you count Castle Rock in the Blue Mountains. Love your snowscape, pretty as a postcard. Thanks for all your kind comments - it's made me more determined to at least manage a tt post each week. The snow was much heavier this year than usual. We had a fabulous day walking and playing in it. ...mmm... - I live in south east london. Well spotted. We have friends in Scotland and try to get up to see them each year. Roy - have just got back from a local fireworks display. No 'Guy' on the bonfire, though! yes, see Scotland DOES get sunshine too, doesn't it?! nice pictures. i was only in Scotland for a day, long enough to cruise around the royal mile and eat some really bad food. My grandfather was Scotish and English. I'm Irish from my other grandfather so love of castles is an inbred thing,lol. Thanks for sharing.